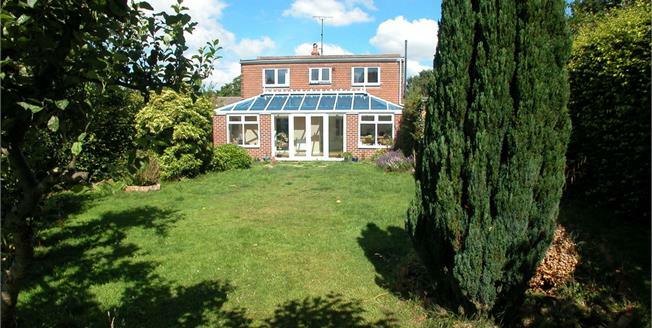 This considerably extended Three Bedroom Detached Dormer Property, stands in a large plot, with a lovely sunny rear garden. The accommodation is much larger than the exterior appearance would suggest. On the ground floor is an entrance hall, along with a large lounge, and bedroom 3, the kitchen has been beautifully re fitted and is open plan through to a huge living room/orangery, with double doors leading onto the large rear garden. Upstairs are two more bedrooms, the master having a large en suite bathroom, and there is a separate shower room. Upvc double glazing is installed and there is a gas fired central heating system. The centre of Neston market town nearby offers a wide range of amenities. ENTRANCE HALL stairs to first floor, radiator. KITCHEN 16' 7" x 7' 6" (5.05m x 2.29m) beautifully re fitted with a range of units comprising sink unit in base unit, further range of base units with cupboards and drawrs, extensive range of contrasting work surfaces, gas five ring hob with cooker hood above, built in double oven, built in fridge/freezer, cupboard with gas central heating boiler, radiator, double glazed window to side. BEDROOM 3 16' 2" x 9' 4" (4.93m x 2.84m) double glazed window to front and radiator. LANDING with built in cupboard. BEDROOM 1 18' 10" x 11' 11" max (5.74m x 3.63m) double glazed windows to side and rear, radiator. EN SUITE BATHROOM 16' 3" x 6' 5" max (4.95m x 1.96m) re fitted with a white period style suite comprising rolled edge bath, pedestal wash basin, low level w.c. separate tiled and glazed shower cupbicle, chrome radiator/towel rail, double glazed window, ceramic tiled walls. BEDROOM 2 11' 9" x 11' 0" (3.58m x 3.35m) double glazed window to rear. radiator. ATTACHED GARAGE 23' 0" x 10' 0" (7.01m x 3.05m) with up and over door, light and power connected, personal door to house. The large rear garden is predominantly laid to lawn, with a tremendous variety of mature plants, trees and shrubs, apple trees, and soft fruit bushes. The garden enjoys a southerly aspect and a good degree of privacy.